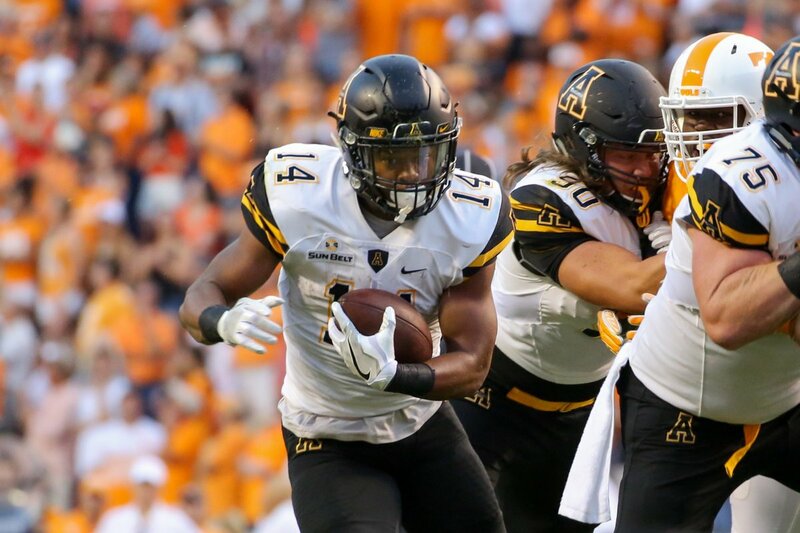 BOONE, N.C. — From a scheduling prospective, last week was nearly the perfect time for Appalachian State to face Tennessee. The Mountaineers may have finished one play short of victory in the 20-13 overtime loss to the ninth-ranked Volunteers, but ASU certainly grabbed Tennessee’s attention. Pardon the Vols if they may have been looking ahead to this Saturday’s “Battle at Bristol” against Virginia Tech. This Saturday, it will be Appalachian’s turn to make sure it is focused for an opponent that is a decided underdog before a big-time. The Mountaineers meet Old Dominion at 3:30 p.m. in the 2016 season opener at Kidd Brewer. This contest comes exactly a week ahead of ASU’s contest against Miami — the most highly-anticipated, regular-season home game in school history. But even though the Mountaineers are 21-point favorites and dismissing the fact that App State dismantled the Monarchs 49-0 on a rainy afternoon in Norfolk, Virginia last September, players and coaches said this week they they are not looking ahead to Miami. “In college football, you can’t overlook anyone,” said senior running back Marcus Cox, who is coming off a sparkling 24-carry, 115-yard rushing performance against Tennessee. Cox also caught two passes, one for a 33-yard touchdown in that game. ASU linebacker John Law, the preseason Sun Belt Conference defensive player of the year, look around at his teammates on Wednesday at practice and felt a surge of confidence about this Saturday. Cox and Law are among the Mountaineer team leaders on offense and defense that sell ASU’s one-game-at-a-time approach. It is one of the reasons that Appalachian has won 17 of its past 20 games since the middle of the 2014 season. ASU also can take confidence that after a stinging 41-10 loss to eventual FBS national runner-up Clemson last season that the Mountaineers took their frustrations out on ODU in their next game, two weeks later. If there was any hangover from the disappointing loss at Tennessee, it dissipated by the time the Mountaineers began practicing this week. Like Appalachian, Old Dominion has been in the midst of a transition from the Football Championship Subdivision to the Football Bowl Subdivision. Unlike ASU, the Monarchs didn’t stick around FCS long enough to win three national championships. While Appalachian and Georgia Southern were building success in the Football Championship Subdivision with a combined nine national titles on the way to accepting bids to the Sun Belt, Old Dominion is one of a number of schools who has started, or restarted football in the past few years and has used its quick success — with back-to-back FCS playoff berths in 2011-12 — to secure its future in Conference USA. The Monarchs haven’t found quick success in FBS like ASU and GSU have, however. After rattling off a 46-14 record in his first five years of the building the Old Dominion program, coach Bobby Wilder has watched his squad drop to 6-6 and 5-7 in the school’s first two years as a full Conference USA member. Wilder does have at least one pleasant memory of Boone. He was Jack Cosgrove’s offensive coordinator when Maine upset Appalachian 13-7 in a hard-fought, 2002 first-round playoff game in Boone. Coming up with a victory on Saturday might be more difficult for the Monarchs, however. Old Dominion is playing with three days of less rest than Appalachian after having to reschedule its season-opener — a 54-21 victory over FCS Hampton — due to weather concerns regarding Tropical Storm Hermine that moved the game from last Saturday to Sunday. “I believe (Appalachian State) is the most complete team we have ever played in our history,” Wilder said during his Tuesday press conference. Hampton struggled at times against Hampton, leading just 31-21 in the third quarter before the ODU special teams recorded a safety and Aaron Young broke it open with an interception return for a touchdown that started the Monarchs’ 23-point second-half outburst. Quarterback David Washington completed 10-of-18 passes for 187 yards and a career-tying four TDs and running back Ray Lawry rushed for 110 yards and caught two passes for 62 yards, while scoring a pair of touchdowns. While happy with the win over Hampton, Wilder is worried about the Mountaineers.